Apply Colorescience Sunforgettable SPF 30 Brush Perfectly Clear generously and uniformly before sun exposure, repeat application after perspiring, immersion in water or toweling. Application brush should be cleaned regularly with Brush Cleanser for optimal results and ease of product usage. I can't say much about quality of this product because I could not get it out of the bottle. I knew that this product has packaging issues from the previous reviews but I thought that I will make it work. Well, I gave up my attempts after a week of shaking it.If you need sufficient spf in a powder form, I would recommend you to buy a good pressed powder instead, so you are in control of how much and where to apply. And you can apply it much faster and easier on the go than with this "on-the-go" product. I would not rely on it for a serious sun protection either, the layer is simply too sheer. This contains dimethicone btw, is not a mineral veil. Cheaper than correcting sun damage later, right? This is an expensive little sunscreen, but once you have the brush, you can order refills for quite a bit less.What makes it worthwhile to me is that it's so easy to keep in my purse and apply. That plus it being a powder makes it easy for me to refresh my sunscreen protection throughout the day, which is almost invaluable. I can't get new skin at any price, and treatments to decrease sun damage are $$$$$.I like that this is a physical, not chemical, sunscreen, that it's lightweight and nearly invisible, and that it's sheer enough that I don't need a mirror to apply. 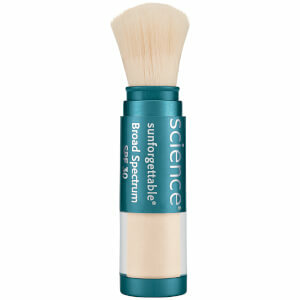 I have been using the Colorescience Sunforgettables brush for several years and love the product! I had been purchasing from a competitor of Skin Store that had very poor customer service, did not delivery on time and very long wait time every time I called customer support (even to place an order). I was able to very easily place an order with Skin Store the last time that I was let down by the competitor. An online support rep even gave me a code for a discount to match the promo that the other company was offering. Product arrived right on time as promised and I was very satisfied with the experience! The Colorscience Sunforgettable applies like makeup that you simply brush on. It totally protects from the sun (SPF 30) and is easy to carry in your purse or pocket. It lasts for months and I use it liberally and daily year-round and would never leave home without it! So convenient and goes over makeup.Well worth the money. Amazing product! I STARTED USING THIS A COUPLE OF YEARS AGO. The true test came playing summer sports. The product stays on and protects. I love it. I recently introduced it to friends while on a trip. They were ecstatic at the coverage and ease of use. I now send as gifts..a great gift!! Thank you. This sunscreen is the best sunscreen I have ever used. Living in Central Queensland (Australia) and working in a harsh climate I need a great sunscreen. This is the best. So easy to apply and no grease. Will be ordering this in bulk. It is not true that the powder does not rub off; it does and it stains clothing. This is a great sunscreen for those of us who don't want a shiny, greasy face (I find even the "ultrasheer" lotions are too shiny). It also helps absorb oil on my nose, and the slight tint helps even out discolorations and large pores. I thought it might exacerbate acne, but it hasn't. Recommended. I have perhaps found the perfect sun tan protection. I have oily skin and this not only gives me great sun protection but helps reduce the oily skin look. The greatest product I have bought so far from the Skin Store and overall a close second to sliced bread as a product. The only complaint is that the brush cleaner did not come with the product and I had difficulty ordering from the Skin Store web site.